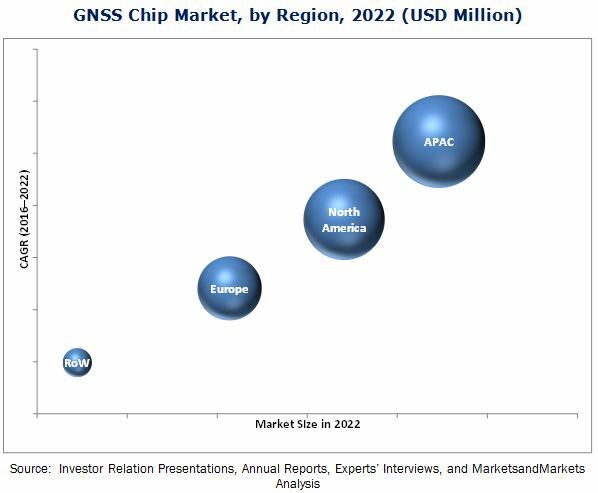 [169 Pages Report] The GNSS chip market was valued at USD 3.11 Billion in 2015 and is expected to grow at a CAGR of 7.9% between 2016 and 2022. With the growing demand for high-speed internet for applications such as distance learning, autonomous driving, multi-user gaming, and video calling, among others, the requirement for 4G/5G network is increasing rapidly. The increasing demand of IoT and miniaturized portable products are the key driving factors for the GNSS chip market. The base year considered for the study is 2015 and the forecast period is considered between 2016 and 2022. The objective of the report is to provide a detailed analysis of the GNSS chip market on the basis of device, application, vertical, and geography. The report provides detailed information regarding the major factors influencing the growth of this market. It also gives a detailed overview of the value chain in the GNSS chip market, analyzes the market trends, and provides the Porter's five forces analysis. The research methodology used to estimate and forecast this market begins with capturing data on key vendor revenue through secondary research such as IEEE journals, The Journal of Navigation, and leading players’ newsletters. The vendor offerings have also been taken into consideration to determine the market segmentation. The bottom-up procedure has been employed to arrive at the overall size of the global GNSS chip market from the revenue of key players. After arriving at the overall market size, the total market has been split into several segments and subsegments, which have then been verified through primary research by conducting extensive interviews of people holding key positions such as CEOs, VPs, directors, and executives. The market breakdown and data triangulation procedures have been employed to complete the overall market engineering process and to arrive at the exact statistics for all segments and subsegments. The breakdown of the profiles of primaries has been depicted in the following figure. The GNSS chip ecosystem comprises chip manufacturers, system integrators, and distributors. The players involved in the development of GNSS chip include Qualcomm Incorporated (U.S.), STMicroelectronics N.V. (Switzerland), Intel Corporation (U.S.), Mediatek Inc. (Taiwan), U-Blox Holdings AG (Switzerland), Broadcom Corporation (U.S.), Furuno Electric Co., Ltd. (Japan), Skyworks Solutions, Inc. (U.S.), Quectel Wireless Solutions Co., Ltd. (China), and Navika Electronics (India). This research report categorizes the global GNSS chip market on the basis of device, application, vertical, and geography. The GNSS chip market is expected to be valued at USD 5.22 Billion by 2022, growing at a CAGR of 7.9% between 2016 and 2022. Some of the factors driving the growth of the GNSS chip market include the high penetration of electronic, wearable, and connecting devices; increasing demand for accurate and real-time data; rising demand for high-speed Internet and network coverage such as 4G/5G; and growing popularity of IoT. The GNSS chip market has been segmented on the basis of device, vertical, application, and geography. The GNSS chip market for in-vehicle systems is expected to grow at a high rate between 2016 and 2022. GNSS chips are used to provide precise positioning, and the in-vehicle systems are mounted on excavators, dozers, graders, and scrapers used in the construction industry. In-vehicle systems are considered ideal for navigation applications as these systems are capable of providing real-time information pertaining to the current status of the vehicles and guiding the drivers accordingly. Moreover, these systems can integrate infotainment technologies, which enhance driving experiences as well as the attractiveness of a vehicle. Location-based services (LBS) held the largest share of the GNSS chip market for applications in 2016. The market for LBS is expected to grow at a rate during the forecast period, owing to the increasing demand for navigation and in-vehicle systems worldwide. GPS/GNSS technologies are being increasingly used for surveying and mapping applications such as tracking of unfamiliar locations suitable for construction, agriculture, and mining as well as for other location-based services. GNSS chips are integrated in mobiles and other navigation systems to receive signals from various constellations or combination of constellations. The GNSS market for the automotive vertical is expected to grow at a high rate between 2016 and 2022. Connected cars are equipped with devices that enable Internet access using GNSS chips; these devices allow the cars to communicate with other cars on the road. Therefore, the increasing demand for connected cars is fueling the growth of the GNSS market. The market for the construction vertical would grow at a considerable rate between 2016 and 2022. GNSS receivers provide precise positioning of dirt or loading materials with the help of smartphones, thereby optimizing the operations in the construction sites. GNSS receivers are used to provide accurate positioning information on construction sites. Due to this, the demand for GNSS chips in the construction industry is increasing. APAC is expected to be the fastest-growing market for GNSS chips. China holds the largest share of the GNSS chip market in APAC; the market in China is expected to grow at a high CAGR during the forecast period. China is a developing economy and is considered as a major consumer electronics manufacturing hub, and consumer electronics is an emerging application area for GNSS chips. In addition, the technological advancements in the smartphones and consumer electronics sectors as well as the growing popularity of wearable devices are driving the demand for GNSS chips in APAC. Moreover, APAC is home to some of the major consumer electronic and wearable device manufacturers such as Samsung Electronics Co., Ltd. (South Korea), Panasonic Corp. (Japan), Sony Corp. (Japan), and LG Electronics Inc. (South Korea), which are integrating GNSS chips in their miniaturized electronic devices. One of the key restraining factors for the growth of the GNSS chip market is the requirement of high initial investments. The agriculture sector deploys GNSS systems in applications such as tractor guidance, monitoring automatic steering-wheel movements, and so on. However, the farmers have to bear the high price of devices and equipment used for precision farming as an initial investment. The GNSS technology-enabled devices used in navigation and mapping applications are expensive and are usually purchased along with actual farming equipment. The key market players such as Qualcomm Incorporated (U.S.), STMicroelectronics N.V. (Switzerland), and Intel Corporation (U.S.) are focusing on new product launches and developments, acquisitions, and collaborations to enhance their product offerings and expand their businesses. 13.8 Furuno Electric Co., Ltd.
13.10 Quectel Wireless Solutions Co., Ltd.